I missed doing my Friday favourite this week but fear not, you can read it now. This week I have visited London twice for two separate gigs (Alexisonfire and Florence and the Machine if you were wondering. And yes, they were brilliant). While I was there I took the opportunity to pop to Spitalfields Market for a bit of Christmas shopping and a visit to my favourite book stall. It is no exaggeration to say this stall is one of the best I've come across. 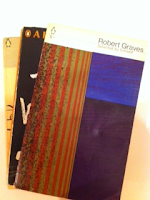 It is packed full, mostly with Penguin classics, some first editions, which are all utterly gorgeous. If it wasn't so busy I could spend hours just flicking through the piles and piles of well-organised books (split into categories which is a delight for the obsessive in me). I've cast aside my attempts at a book ban and picked up a couple, but in the circumstances I was still very restrained. I almost grabbed an old guide to Somerset just to skim and have on my shelf but resisted. Maybe next time. I decided to get whatever took my fancy instead of searching for authors I already know I like so hopefully I have discovered a few gems. 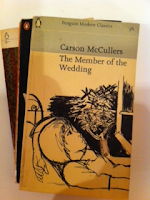 Carson McCullers The Member of the Wedding Susan Hill mentions Carson McCullers in Howards End is on the Landing and I must admit I was attracted to the name. Shallow probably, but who's going to judge. I think I was also attracted to a challenge Hill subtly proposes in regards to gendered writing. She claims that a man could never be mistaken to have written Anita Brookner's novels but McCullers's could easily be mistaken as having a male author. We shall see. Robert Graves Selected Poetry As a First World War enthusiast (wrong word? ), I am ashamed to admit I have never read any of Robert Graves's poetry. I didn't take much persuading to pick this one up to rectify that blatant hole in my WW1 knowledge. 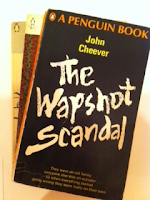 John Cheever The Wapshot Scandal Finally, a guy doing his MRes at the same time I did my MA gave a paper on Cheever and it all sounded very interesting so thought I'd give this one a go. I'm certainly looking forward to cracking on with these. Anyone read any of these?